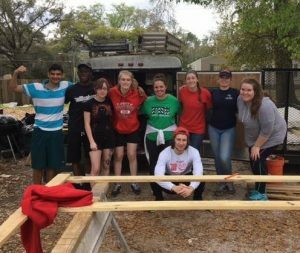 For the second straight year, a huge team of Wittenberg University students on spring break drove to the Southeast last week — not to hit the beaches but to hit nails … a whole lot of nails. Fifty came from the Springfield, Ohio, school for alternative spring breaks last week — driving hundreds of miles before splitting into five groups working with Fuller Center for Housing covenant partners in Atlanta, Perry, Americus and Albany in Georgia and Tallahassee in Florida. Board member Jackie Goodman made sure that students got an overview of the many sights, sounds and tastes of the Atlanta area, while Director Mark Galey kept the students busy during the day, including a project for a Jewish family. At a time when anti-Semitic acts have been rising, Galey was glad that the students could express their Christian love for others while witnessing The Fuller Center’s commitment to ecumenicalism and service to all of God’s people. outstanding video about the group’s experience in Georgia. 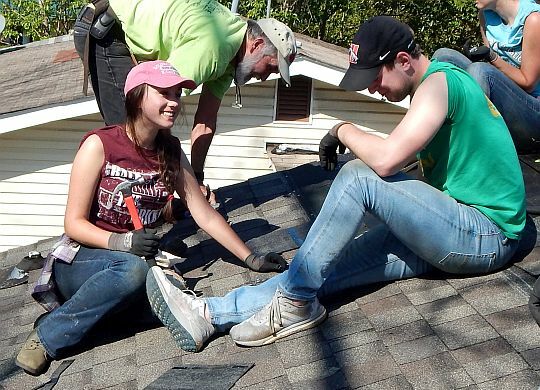 In Perry, eight students worked with local President Warren Johnson and two local volunteers — Coy Goff and Michael Boden — to repair the roofs of two elderly women, including Velma Robinson, who has lived in the same house all of her life. 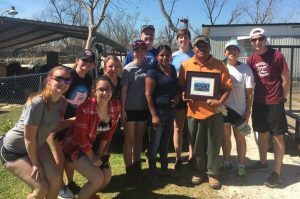 Jenn Downing also worked with the Perry Fuller Center during her 2016 spring break. She could have headed for the beach this year but instead chose to be a team leader and return to Perry. Fuller Center Director of Communications Chris Johnson said the students’ visit helps the small-town covenant partner garner media attention (including this front-page centerpiece photo in the Macon Telegraph), renews the energy of local volunteers and enhances relationships with church partners, including First Baptist Church of Perry, which hosted the students in a vacant house on its property. article about the students’ work that you can read at this link. used the students’ visit as inspiration for his latest article. 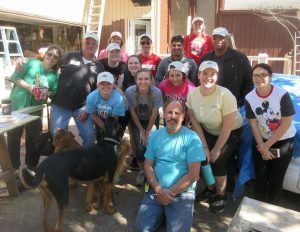 In Americus — also home to The Fuller Center’s international headquarters — the students worked on a couple of different projects, including restoring a donated home to decent condition and helping transform a space above the Americus-Sumter Fuller Center’s headquarters into a transitional housing space. Rachael Fink appreciated being able to work alongside people like Thad Harris, an Americus-Sumter Fuller Center homeowner partner who also has become a local board member and one of The Fuller Center’s most prolific volunteers, inspiring hundreds of people while rolling around job sites in his wheelchair. work on the Americus-Sumter Facebook page. In Albany, students saw the widespread damage caused by two bouts with January storms, the second of which spawned a devastating tornado. 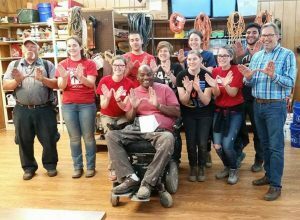 While helping Ricardo Miguel’s family repair damage to their storm-damaged mobile home, the Wittenberg students also helped put a major initiative on the map, sparking media coverage of Albany Twin Storms Relief. Also known as “A2,” it is an effort to help families affected by the storm who lack adequate housing insurance or who have been overlooked by FEMA efforts. The Albany Area Fuller Center is a primary partner in the effort. See the complete story in the Albany Herald newspaper. Facebook photo gallery with more than 180 pictures. 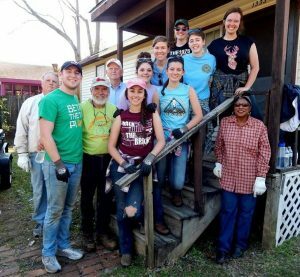 In Tallahassee, Florida, students worked on five homes in a low-income community. Though most had little to no construction experience, they learned that it’s the passion for helping others that makes a difference. 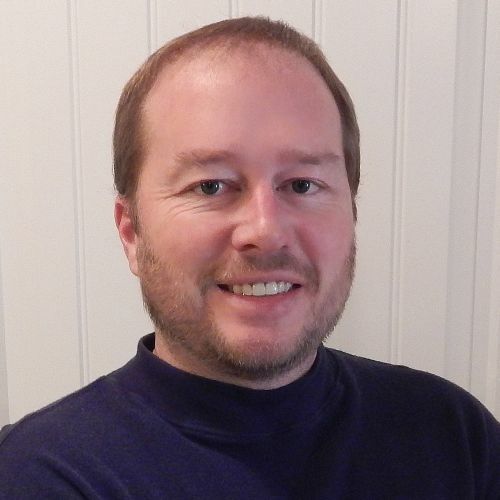 “What I learned was that regardless of your previous skills, anyone can contribute anything to any cause, so that was a really rewarding experience for me,” Alex Quillin said. Their efforts not only improved homes in the area, but they provided inspiration and hope for the residents — including some of the youngest residents. View WCTV’s report on the students’ efforts. Your coverage on Facebook and in the paper are great! Thank you! And thank you for everything you do through Samaritan’s Closet to support the work of The Fuller Center and other great nonprofits!